Poetry, therefore, is a more philosophical and a higher thing than history: for poetry tends to express the universal, history the particular. The Deposito Martyrum, a document cataloguing martyrs within the catacombs of Rome is the first reference to the 3rd century figure known as Saint Sebastian. Later accounts, compiled in the Acta Sanctorum describe the Acts of Saint Sebastian, largely believed to be a commentary by Saint Ambrose of Milan related in the 4th century. Sebastian is related to be an esteemed member of the Praetorian Guard, using his position to bring comfort and healing to Christians suffering the persecution of Roman Emperor Diocletian. Upon discovery, he was sentenced to death, with fellow Roman soldiers riddling Sebastian with many arrows "like an urchin" (porcupine in some translations). Despite his injuries, Sebastian was not killed, and was nursed back to health. Sebastian's recovery gave him a stronger resolve to chastise Diocletian for his mistreatment of the Christians. Outraged, the emperor's men set upon Sebastian, killing him and dispatching his body into a sewer. His body was later retrieved and given an honorable burial. 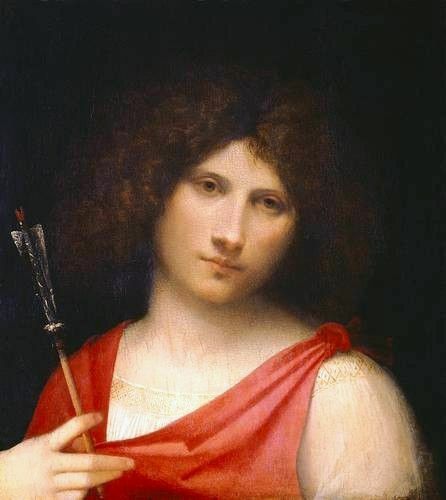 By the 15th century, Sebastian began to appear more commonly as a beautiful youth, often his body not pierced, sometimes merely holding an arrow. This became reminiscent of the figure of Apollo, associated with the healing of diseases and pestilence since antiquity. Apollo was also the god of music and poetry, described as a handsome youth and often depicted with his various attributes, including laurel, a bow and quiver, or a musical instrument. Interpretation of this visual phenomenon has been a contentious subject, with some scholars arguing that Christians would not identify with Apollo due to a "differing world view" than their pagan ancestors (see Marshall). That being said, some account must be made of the evolution in depictions of Saint Sebastian, and their possible link to Apollo. To explore this point further, Raphael's famous depiction of the saint is a worthy case study. Saint Sebastian was a popular theme in the art of the middle ages and Renaissance, often invoked as protector during times of plague. The original patron for this work is presently unknown, though owing to its size it is commonly reported as intended for private devotion rather than use as an altarpiece. The ovoid face and rounded cheeks show this piece to be painted in a style more consistent with Raphael's pre-Florentine exposure, hence the most widely accepted date places it before 1504. The iconography of the saint is a fascinating topic, with a great deal of variation in depictions across the ages. 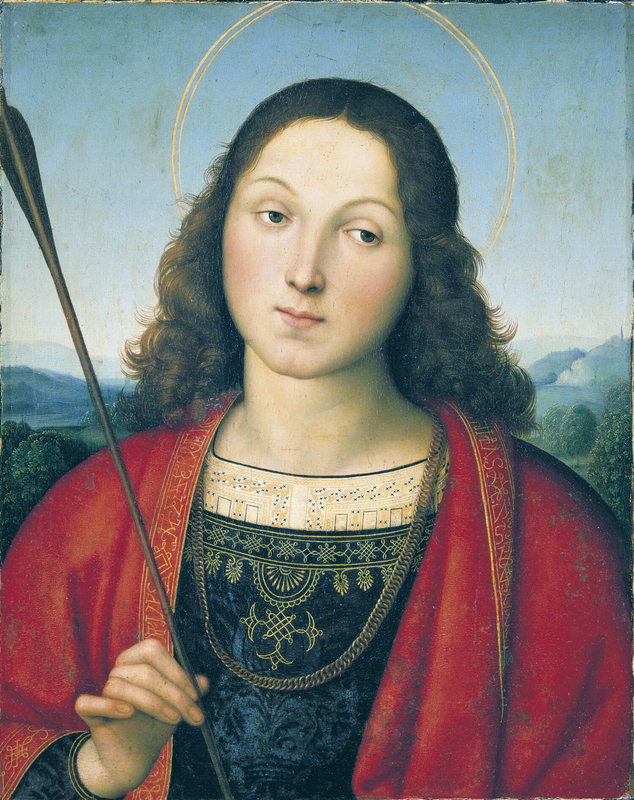 This image shows a comparatively serene Saint Sebastian, who was often depicted partially clothed, and often pierced by arrows. 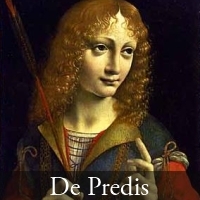 Versions by Perugino show the saint in various guises, others show the saint with bow and arrow, or wearing a sword. 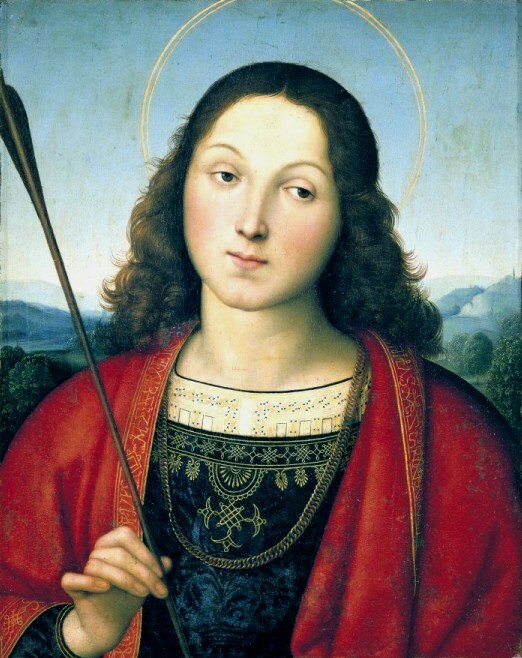 The youthful appearance of the saint is a common motif across Italian depictions in the 15th and 16th centuries, with red drapery and/or the arrow being consistent iconographic markers. Perhaps the most distinctive aspect of Raphael's treatment in this example is the frontality of the pose, including the rendering of the figure in half-length. The detail on the undershirt and tunic are particularly noteworthy, described as resembling musical notation. In the gold lining of the red garment draped over the figures shoulders it is possible to make out stylised letters - a device used by Raphael (and other artists) to append elements of a signature into the composition. 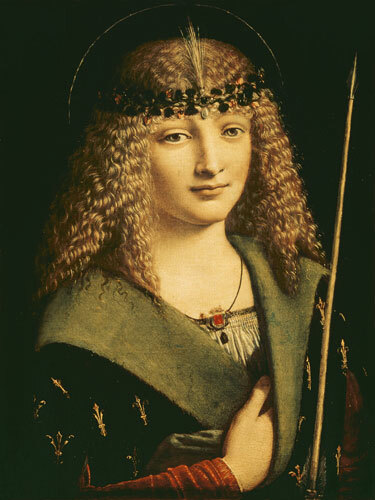 The highly embroidered robe, the pattern on the shirt like notes of music, the slashed velvet of the jerkin…point to a love of ornamentation which comes from Pinturicchio but the saint’s neck-chain, clearly copied from a real example…is close to northern painting and has no equivalent in the work of Perugino or Pinturicchio. A northern work that fits such a description is van der Weyden's Portrait of Anthony of Burgundy (c.1463). Anthony was noted to be a experienced soldier and archer, and is renowned as a prolific collector of illuminated manuscripts. 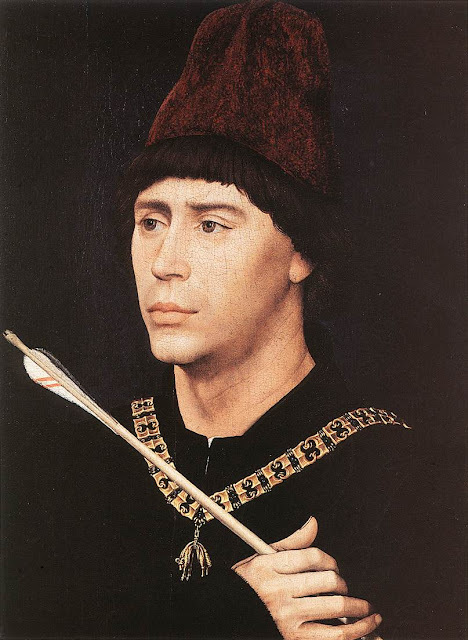 The chain he wears contain symbols of his association with the House of Burgundy, the held arrow often quoted as a specific reference to his skill as an archer with the Guild of Saint Sebastian. However, the duality of meaning is apparent even in this earlier depiction, the affinity of the soldier to noble Saint Sebastian, as well as the affinity to literature makes the suggestion of Apollo equally plausible. 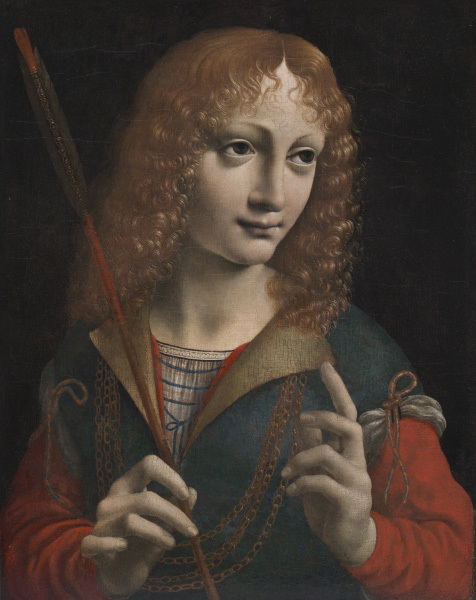 Other contemporary half lengths of Saint Sebastian can be seen in examples such as by Leonardo pupils De Predis (late 1480s) and Boltraffio (c.1500). Each show a predilection to the northern portrait style. Similarity of the features of Raphael's Saint Sebastian with the figure glancing at the viewer in the 1504 piece Sposalizio are also noted. Commentators such as Shearman describe the figure in Sposalizio as a possible self-portrait - hence the similarity of this figure must include some consideration of Raphael's use of a common model, which may or may not have been himself. 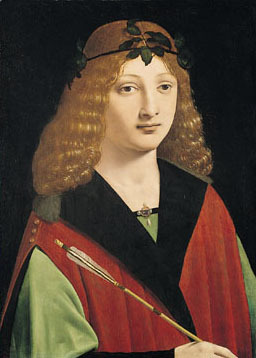 However, a closer look at figures executed by Perugino betray a similar set of features, indicating Raphael may have been drawing on figural templates created by his master rather than modelling his own features. In any event, whilst such discussion is a perennial point of interest for art historians predisposed to a mode of visual analysis, the absence of documentary evidence surrounding this work makes any such discussion speculative at best. The manner in which Raphael's figure holds the arrow is particularly interesting. From a philosophical perspective, the posture of the right hand matches exactly that which an artist would use holding a stylus or paintbrush. Proponents of this mode of analysis would suggest that a mirror may have been used as a compositional aid in this work - as demonstrated in the work of other Renaissance artists by Fried. Saint Sebastian is the favourite saint of the Italian women, and more particularly of the Roman women. His youth, courage, and beauty of person, the interest of his story, in which the charity of woman plays such an important part, and the attentive character of the representation have led to this preference. Instances are recorded of the figure of St. Sebastian producing the same effect on an excitable southern fancy that the statue of Apollo produced on the 'Girl of Provence' - a devotion ending in passion, madness and death. 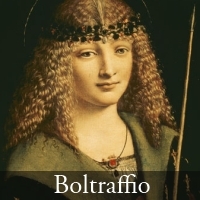 A great example of a crossover image representing the fusion of Apollo and the saint is Boltraffio's Portrait of a Youth Holding an Arrow (c.1500-10). Remarkably similar to his Saint Sebastian, this work is believed to depict the artist's friend, Bolognese poet Girolamo Casio. The key identifier of the figure as Apollo rather than Saint Sebastian being the band lined with laurel around the head. 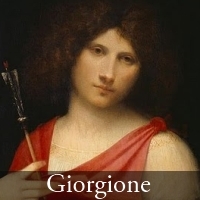 Giorgione's Boy with an Arrow (c.1508) has also been forwarded as a thematically related piece, with interpretations wavering between sacred and classical. Art historical literature on sacred subjects sometimes asserts that modern viewers can not hope to understand the realities of the spiritual existence of past societies. Such statements are essentially rhetorical in nature. Instead, looking at the documentary and visual remnants of eras past, we can perhaps observe patterns that shaped the great variation in the depiction of highly popular themes, and how their meanings became intertwined into the spiritual and secular lives of people they were created for. An artist plying their trade during the Renaissance was in constant competition against other artisans and creative individuals. That they drew on beauteous forms and wondrous textual sources of the past is not evidence of a heretical construct, but an ability to engage the creative spirit to produce pleasing and lucrative works. Cuzin, P. Raphael, His Life and Works. Chartwell Books.1985. p.20. Very interesting! Although I never had considered the connection with Apollo and Sebastian before, I'm not surprised to know of those similarities. Christians often have absorbed the classical imagery for their subjects - I'm particularly thinking of the Early Christians and how Christ often was depicted as a beardless, Apollo-like figure. In fact, because Christ was often associated with Apollo in art, I wonder if the visual parallels between Sebastian and Apollo really extend to associate Sebastian with Christ. Both figures are associated with physical suffering. And Sebastian was tied to a stake, similar to how Christ was nailed to a cross. These are just half-baked ideas, but I wonder if anyone has found some parallels between Christ, Sebastian, and Apollo. If there are connections between Christ and Sebastian, is might account for why Sebastian is depicted as a frontally-oriented figure, since Christ often appears that way on the cross. In your research, did you come across any painters earlier than Perugino that were utilizing this frontal composition for Sebastian? It seems like this association with Sebastian is a Renaissance convention. I can't think of any frontal depictions of Apollo from classical times off the top of my head, although I wouldn't be completely surprised if they exist. Even recently, there have been some great monographs on the depiction of Christ in art - though the references listed under Marshall and Jameson are great places to start. Sebastian does not get as much coverage, which is what I hoped to address in this post. 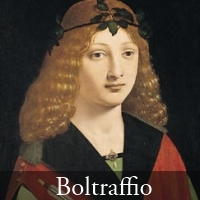 What I found most fascinating however wast how the suggestion of Apollo not as a healer but as the god of poetry and music crept into these depictions - so wonderfully evident in the Boltraffio image of the youth with an arrow. Thanks for a very through, balanced article. As usual the images were great. Your conclusion was right on the money. It's interesting in your conclusion that you start by talking about the realities of spiritual life in other times, and end by talking about lucrative work! My initial impression in trying to imagine the spiritual existence in Renaissance Italy was to imagine looking at one of these lovely paintings in a darkened hall - no electric lights, no telephones, no cars rumbling in the street outside. A quiet contemplation in a less superficial time. But after reading and re-reading the conclusion I thought, of course, the Church was vastly rich, and had no qualms about selling indulgences and finding other ways to increase their wealth. It's idealistic to imagine the world was any less materialistic then. Fortunately for us, a lot of the Church's wealth was invested in art and architecture! @Frank - I'm glad you enjoyed the article, especially the conclusion - I sweated over its exact wording for some time! The autobiography of Benvenuto Cellini, or John Shearman's stunning compilation Raphael in Early Modern Sources gives us a direct account of the commercial enterprise and interpersonal turmoil involved in the business of being an artisan during this period. Can you imagine a head of state in this era having their homes painted depicting themselves at the Adoration or the Nativity? It would seem outrageous, yet we somehow gloss over that the Medici, Sforza, Borgia etc did exactly this when they were still alive. A great conflagration of of money and ego are what fueled much of the visual wonder that is the Renaissance.